The book is divided into 7 separate-but-related essays and a conclusion. The first three essays are historiographical, and tackle in order: the meaning of "Migration Age," the thesis that the invasions caused Rome's fall, and the myth that a German consciousness existed prior to the Middle Ages. 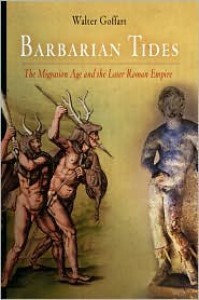 The next four essays deal with four aspects of the late Roman Empire and its responses to the "barbarians": "Jordanes' Getica and the Disputed Authenticity of Gothic Origins from Scandinavia"; "The Great Rhine Crossing, A.D. 400-420, A Case of Barbarian Migration"; "The 'Techniques of Accommodation' Revisited"; and "None of Them Were Germans: Northern Barbarians in Late Antiquity." The final essay draws all these disparate threads together to offer an explanation of Rome's "fall" and the emergence of medieval civilization. Goffart acknowledges that he only uses the literary sources in his discussion, ignoring (for the most part) recent archaeology and ethnographic studies because he feels that, while they can discern material conditions, they can't differentiate linguistic or political change. To the extent that we can, we are limited to the textual survivals. The "Migration Age" is the latest English translation of the German Volkerwanderung. The reader should understand that it's German historiography and the paradigm that it established that underlays much of our understanding of Ancient and Western history, and certainly the general citizen's understanding. To wit: The Roman Empire endured centuries of pressure and conflict with Germanic barbarians on its frontiers. In the early 5th century AD, pushed by Hunnic tribes migrating from Central Asia and attracted by the decadent weakness of the late Empire, these tribes achieved substantive breakthroughs along the Rhine and within a century had destroyed the Western Empire and nearly so the Eastern. Furthermore, it's possible to trace a connected line of migrations for distinct Gothic, Vandal, Frankish and other peoples. In it's most extreme manifestations, some patriotic German historians have found Germans as far back as the Bronze Age and into the Neolithic. Goffart identifies 3 traditions of the migration paradigm. At first glance, the most plausible is the "core" theory, which posits a fairly limited Volkerwanderung in both time and space and doesn't claim more for the sources than warranted. The second theory is the "Asian," which emphasizes the "domino theory" of barbarian movements: Somewhere in Central Asia a tribe (for some reason) migrates from its ancestral home, and pushes the neighboring tribe out of theirs and so on in a cascade of dominoes until it reaches the Rhine-Danube valleys and brings down the Romans. One tenet of this theory is the Huns are the direct descendants of the Xiong-nu, a tribal confederation that troubled Han China from the 3rd century BC, and eventually crossed Asia to show up at Rome's doorstep in the 5th century AD. All this ultimately based on a passing resemblance between "xiong-nu" and "hun." Finally, there's the "Germanic" strain, which claims to be able to trace the "German" race (or, more PC, the ethnicity) back through the mists of time to a fantasy homeland in Scandinavia. All three strains are inadequate to describe what happened along Rome's frontier. The tribes under discussion were nearly all sedentary agrarians (w/ exceptions like Huns and Avars, who really did begin as nomads). When migrations occurred, they were small scale in time and space - not vast, centuries-long wanderings. Goffart's historiographical essays make the following claims, offering an alternative view of what transpired (pp. 233-4): (1) The tribes of the Migration Age were not "wandering" peoples - they moved from a specific place and for a specific reason. There was no significantly greater tribal movement in the 5th century AD compared to the 2nd (for example); the difference was in Rome's capacity to respond. (2) "Germans" did not overthrow the "Roman" empire. Most tribes were destroyed (anyone remember the Scirians?) and the surviving peoples settled on Roman soil as "adherents to the Roman religion, defenders of Roman populations and laws, and preservers of the Roman language." (3) There were no "Germans" until the Middle Ages, and the notion of Vandals, Goths, etc., as foreigners from a distant, far northern homeland is a fiction born in Justinian's campaigns to restore the empire in the 6th century. This last point is the focus of chapter 4, where Goffart demolishes the myth of Gothic origins by arguing that Jordanes' Getica was written by a Constantinopolitan who may not even have been a Goth, based on the work of Cassiodorus, an Italian at Theodoric's court in Ravenna. In point of fact, there's no reason to believe the people identified as "Goths" came from Scandinavia nor even that there was a consciousness of continuity between any putative northern origin and the people who invaded the empire. In the 5th chapter, Goffart tackles the Rhine crossing on Dec. 31, 405/Jan. 1, 406, when a confederation of mixed tribes crossed the frozen Rhine, denuded of defenders called back to the hinterland to serve in the civil wars racking the empire at the time. Goffart doesn't attempt to ascertain motive - he can't. No one really can as the evidence doesn't exist. Consensus says it was Hunnic pressure from the east but there's no real evidence for this; it could have been internal pressures unremarked in later writings; it could have been provoked by Constantinople in its rivalry with Ravenna; or it could have been all or none or some of the above. "What decided the Danubians to combine with Alans and launch a one-way invasion across the Rhine is beyond our powers to determine. We can only be certain that...their behavior was hardly anomalous. Although the Empire left itself open to attack, it mattered more that barbaricum seemed worthy of being abandoned for a better if more perilous life" (p. 237). Chapter 6 is a dense explanation of how barbarians were settled in the empire without too much social and economic disruption. It's based on Goffart's earlier work, [book:Barbarians and Romans, A.D. 418-584], which stirred controversy because it turned common understanding - that Rome gave direct ownership of land to barbarians - upside down. Instead, the fractions of "land" allotted to barbarians refer to tax revenues. In order to finance barbarian settlements and do so in a manner that didn't generate massive unrest "imperial authorities abandoned a complex military system based on the collection of taxes and their redistribution to soldiers as rations and pay, and exchanged it for a scheme in which taxpayers and their assessed properties were directly assigned to individual soldiers as the permanent, hereditary source of their sustenance" (p. 236). Chapter 7 is a series of case studies about some of the lesser known barbarian tribes, and a reflection on Gothic identity in Roman Italy. The thrust of the first part is that ethnic identity was fluid, fixed only in subsequent, more settled centuries looking to solidify their own ethnicity. The reconquest of Italy by Justinian is a prime example of that: There was no "Gothic" consciouslness. Totila, the last Ostrogothic king, fought to be recognized as the legitimate representative of the nomen romanum in Italy.